Customize navigation applications for route guidance and accurate turn-by-turn driving directions. Esri released version 1.0 of StreetMap Mobile Software Developer Kit (SDK) in fall 2007, a powerful yet simple developer toolset for building custom mapping and navigation applications for Windows mobile devices, in-vehicle systems, and personal navigation devices. StreetMap Mobile SDK consists of a set of COM components and developer resources and provides advanced functionality for deploying routing, map rendering, and map matching applications. NAVTEQ and Tele Atlas/TomTom provide North American commercial street data in Smart Data Compression (SDC) 2.0 format for rapid map display and high-performance routing. SDC data is available from Esri, or developers can convert existing data from any source using geoprocessing tools. 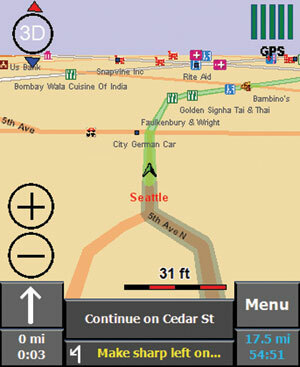 StreetMap Mobile SDK also integrates with Esri routing and logistics software solutions. RoutingStreetMap Mobile SDK allows developers to include multipoint routes, door-to-door driving directions, and quickest or shortest route selection. Barriers, such as road closures, construction, or traffic incidents, can be defined, as well as which roads should be used in route calculations based on type of road or vehicle type and size. LocatingStreetMap Mobile SDK provides geographic locations of street addresses, points of interest, states, cities, and postal codes. Other location functions include performing reverse address geocoding. Map RenderingDevelopers using the StreetMap Mobile SDK can access spatial and attribute data and optimize query display. A rich symbology library, labeling engine, and the functionality to implement scale- and class-dependent rendering allow developers to generate attractive and display-friendly maps. Map MatchingStreetMap Mobile SDK provides the ability to perform map matching to accurately track the location of a mobile device. The position of the device can be snapped to the closest street segment and tracked based on GPS coordinates, direction of travel speed, and GPS signal latency. StreetMap Mobile SDK is designed to provide developers with the tools to create innovative and useful navigation applications. By using StreetMap Mobile SDK, developers will have access to sample navigation applications with source code, detailed documentation, and a sample SDC dataset and will benefit from a quick-to-market custom navigation solution. StreetMap Mobile SDK is currently available to Esri Business Partners and will soon be available to all Esri Developer Network (EDN) subscription members. For more information, visit www.esri.com/mobile.